A cookie press can turn cookie dough into perfect, professional-looking cookies. Once your cookie press is loaded with dough, all you have to do is press the dough onto a baking sheet, and voila! Once you get the hang of it, using your cookie press will be a breeze. Roll your cookie dough into a log. Your cookie dough needs to be log shaped so it's thin enough to fit into the barrel of the cookie press. 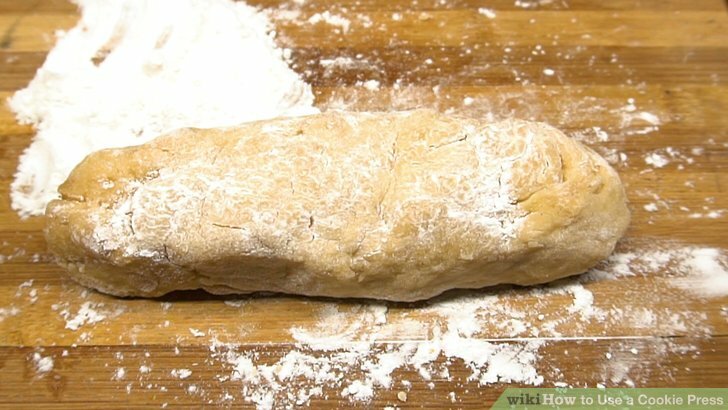 To roll the dough into a log, pick it up and roll it between your hands. Make sure the log is short enough and thin enough to fit in the cookie press barrel. To save time, buy premade cookie dough that comes in a log shape. Avoid using cookie dough that has big pieces like chocolate chips or nuts in it. Use thin doughs like sugar cookie dough and spritz dough instead. Unscrew the ring from the end of the cookie press barrel. The ring is at the end of the barrel (the long tube on the cookie press) that’s opposite the handle. Once the ring is off, you should be able to access the inside of the barrel. Insert the cookie dough into the barrel. Don’t fill up the barrel all the way with dough. You want to leave at least of space at the end of the barrel near the handle. Otherwise, you'll have a hard time pressing the dough out. Insert the patterned disk you want to use into the ring. Your cookie press should have come with different disks that have unique patterns on them. Each pattern creates a different shape cookie. Lay the disk you want to use inside the cookie press ring so it’s flat. Screw the ring back onto the barrel. Make sure the ring is twisted all the way on so it's tight. If the ring is on properly, the patterned disk will be on the inside of the barrel. Once the ring is on the barrel, you're ready to start pressing out your cookie dough! 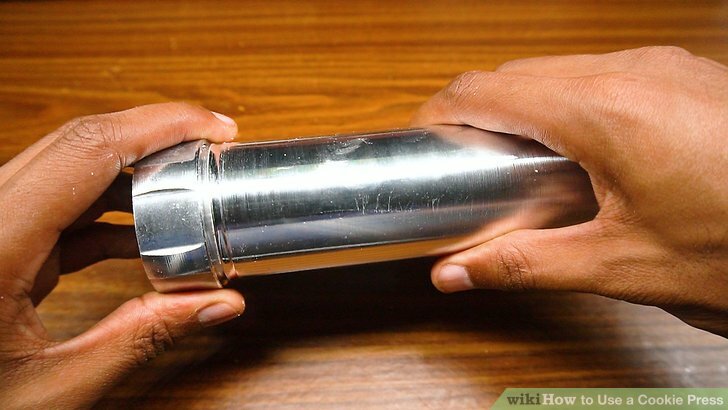 Press out the excess air in the barrel with the plunger. The plunger is the long, thin rod that goes in and out of the barrel. Grab the handle at the end of the plunger and push the plunger down into the barrel. Stop once all of the dough is packed down at the end of the barrel. 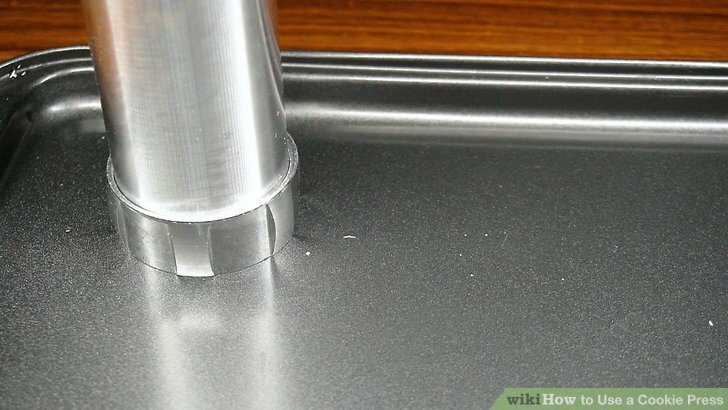 Place the end of the barrel flat on an unlined baking sheet. The barrel should be vertical. Make sure the ring at the end of the barrel is completely flat or the dough might not stick to the sheet. Don't line the baking sheet with anything or the dough won't stick. Pump the handle on the cookie press to press out the dough. When you pump the handle, some of the cookie dough in the barrel will be pressed through the patterned disk and onto the baking sheet. Depending on your cookie press, you may need to pump the handle more than once to get enough dough to come out. If your cookie press doesn’t have a handle or lever to pump, press down on the plunger instead. Lift the cookie press off the baking sheet. You should see a perfectly-shaped piece of dough on the baking sheet right where the ring was. If the dough didn't come out of the barrel, or if it looks broken on the pan, the dough may be too cold. Let the cookie press sit at room temperature for a few minutes and then try again. If the dough isn't holding its shape, it may be too soft. Put the cookie press in the fridge for 10-15 minutes and try again. Repeat across the baking sheet every . Once the baking sheet is covered with dough, bake the cookies in the oven according to the recipe. If there’s any leftover dough in the cookie press, press it out onto a second baking sheet. Take apart and clean the cookie press when you're finished using it. To take apart the press, unscrew the ring at the end of the barrel and set the ring and disk aside. Then, unscrew the barrel from the handle and take off the flat disk at the end of the plunger. Wash all of the detached pieces with soap and warm water and then reattach them to the cookie press.